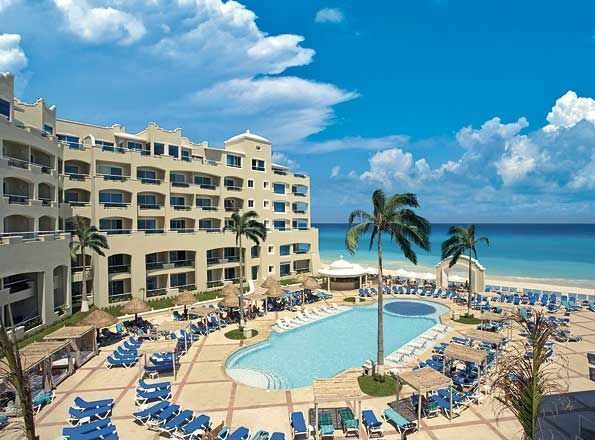 With 477 suites, a pirate-themed waterpark and a friendly staff notable for wanting to please all guests, the Gran Caribe Real Cancun is a five-star family experience. Occupying a quarter of a mile of white sand on Mexico’s Yucatan Peninsula, this resort provides guests with ample opportunity to have fun in the Caribbean sun. Along with the two swimming pools, the Gran Caribe Real Cancun also includes an in-house spa, live music at the well-stocked lobby bar, and the “Real Bazar” for last minute souvenirs. The Gran Caribe Real Cancun, like its sister Real Resorts in the area, promises to “exceed your expectations.” in every way. There are many sizes and styles among guest rooms, most with their own balcony or terrace. We’ve heard that renovations are still underway, so be sure to book one of the newly renovated rooms. Families should reserve one of the 39 Family Junior Suites which sleep a maximum of 5 guests (2 adults and 3 kids). Unlike many “suites” where the kids are asked to share a bed or make use of the pullout couch, the Family Junior Suites at the Gran Caribe Real Cancun offer your little ones a bunk bed and a trundle bed. A stay in this suite ensures that everyone has their own sleeping space. Kids Programs, Waterpark, and All Inclusive Deals. . . Oh My! Another perk for kids at the Gran Caribe Real Cancun are the activities; be sure to check out the free Oki Splash and Oki Kids Club programs. Open to kids ages 4 to 12, daily from 9am to 8pm, the Oki kids programs include watersports, sand castle building, face painting, and drama classes, as well as access with their counselor to the Oki Splash Water Park (the waterpark operates 9am-5pm). At the waterpark, both kids and adults can explore a replica of a 17th century pirate ship, a medieval castle, or slip down water slides. The Gran Caribe Real Cancun also has a program especially for teens. Designed for guests 12 to 17 years-old, the T-Zone is a “subtly supervised” area for teens and tweens to get some time away from Mom and Dad. Open from 11am to 11pm, this activities area includes a media center as well as opportunities for more educational diversions. Babysitting is also available for families with kids too young to participate in the daycare programs. Perhaps the biggest benefit for families is the resort’s all inclusive pricing. That means three full meals a day for your family (just not the lobster), unlimited snacks, a complimentary stocked mini-bar (wth juices and alcohol) in very guest room and room service from 7am to 11pm daily. There’s no reason why your family shouldn’t take advantage of the eight onsite buffets and restaurants. While all of the dining spots are casual (no need to worry about bringing the kids), if you’re traveling with your children, you’ll definitely want to check out the Sunset Grill where kids dinner shows are put on three times a week. The active family will appreciate not being charged extra for non-motorized water sports or lessons at a nearby marina. You can also use the fitness center, partake in daytime and evening entertainment and dancing, and try introductory scuba lessons at the pool. Golfers can take advantage of unlimited greens frees at the Cancun Golf Club (though the mandatory golf cart fee is not included).